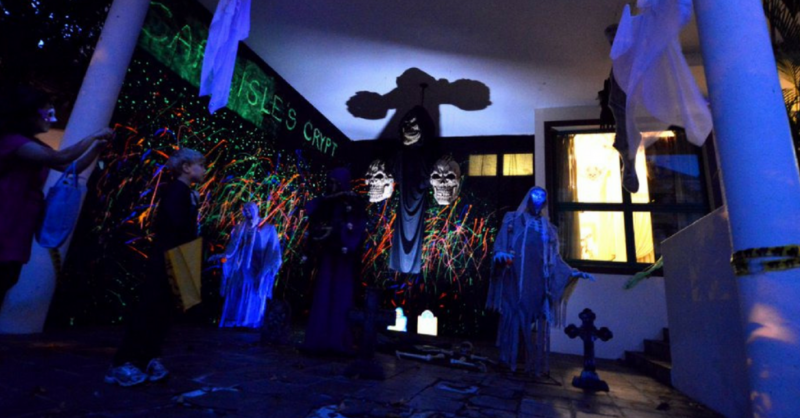 Trick Or Treat In Singapore: The Best 7 Places To Get Spooked This Halloween! Unknown to many, the good old Halloween tradition of trick or treating is very much alive here. There are several trick or treat activities and places in Singapore – complete with elaborate decorations and houses that do give out awesome sweets! This Halloween, get your entire family and friends decked out in Singapore-related Halloween costumes for the good old tradition of trick or treating! Head down to this massive Trick-or-Treating event in the neighbourhood of Woodlands Woodgrove! Dress up as a “monster”, “ghoul” or other “spooky creatures”, and roam freely around the neighbourhood as the roads are closed to maximise your trick or treat experience. We dare you to walk up to frightfully decorated houses, some are complete with scary sound effects, and mutter ‘trick-or-treat’ to receive your reward. Start off at Woodgrove Avenue and weave your way through to the other streets! Dress up, soak in the Halloween vibes, and we guarantee you’ll have a spooky great time. The residents in Woodgrove warmly welcome everyone (both kids, teenagers, and adults alike!) to take part in this huge Trick-or-Treat event. However, do be considerate and respect all the families in the Woodgrove neighbourhood including those who might not be handing out candies. You can also show your appreciation to the community (we heard some families spend thousands annually to decorate their homes and give out candies) by donating items for Caring for Cambodia. Simply look out for homes marked with the Caring for Cambodia drop off point signage. P.S. There’s a culture of using a white pillowcase as your trick or treat bag here! What happens when pontianaks meet vampires? Or when Asian supernatural meets Western horror? Find your answers here at ACM After Dark: Horror Mash Up. Dress to scare as you roam the museum galleries, hearing haunting tales and watching out for a zombie outbreak. There are loads of delicious treats up for grabs, but of course, only if you and your friends have not fallen for any hidden tricks. Head on down to ACM after dark with your friends and family and watch as all hell breaks lose! This year JCube is pulling out all the stops for their third Scream Fest! Uncover the mystery behind Ren Ai School as you make your way through a school maze full of scares and spokes! Admission tickets are priced at $8. Good news for shopaholics out there, if you spend $50 at JCube or $20 at J.Avenue you get free entry into this scarefest! Not for the faint of heart this school maze will make you hope you never step into a school again! Best part? Each admission ticket to Scream Fest 3 lets you ice skate your heart out at The Rink for $7 (U.P $17.50)! So if you’re looking for a spot where you can shop, ice skate AND get scared, JCube is the perfect place to be! Here’s a spooky Halloween party for the little ones! Be entertained by spine-tingling magic shows and a Halloween-themed photo booth. Of course, there’s a wide array of creepy-looking nibbles and candies up for grabs. Book early so you won’t miss out on some spooky fun! Drop your kids off for a spooktastic time at this exclusive eXplorerkid Halloween Spooktacular Party! At this strictly all-kids only Halloween event, spooky highlights include pumpkin-making balloons and exciting Halloween games and activities, not forgetting some scarily delicious nibbles. Let your kids show off their quirky and unique Halloween costumes with the Trick or Treat parade! Furthermore, the best-dressed costume stands to bag even more treats and goodies. Do register your little “vamps” and “monsters” early to not miss this FANGtastic party! Get up close and personal with glowing monsters, mythical mermaids, aliens and many other creatures at this not-so-spooky, merry-not-scary kids Halloween event: Safari Boo @ River Safari! Walk along the Monster Boo trail to fight against the evil Professor V alongside a gang of fun-loving animal monsters! Take up the trick or treat challenge that spans across the entire River Safari and keep a lookout for tricks amongst the treats at the monstrous scale of trick or treat. Are you in for a swashbuckling time at the Spooky Seas of S.E.A. Aquarium this Halloween? Let your little ones follow Captain Spooks as he guides them through the trick and treats trail! Be ready for some little challenges along the way though, that is, if you want to score some delicious candies. Watch at the Skeleton Wanderers descend the depths of the ocean in search of the sea fairies. Is it real or just a spooky dream? No other way but to find out right here at S.E.A. Aquarium! This Halloween, ghosts, monsters, and all sorts of creepy creatures come out to play. Go trick or treating at these spooky yet fun-filled places with lots of creepily delicious candies and grubs. Also, read Die Die Must Party: 10 Halloween Parties That’ll Scare The Living Daylights Out Of You!